Because you cannot smell, see, hear or feel EMF radiation, the best way to find out that not only it is present in your space, but that it is also going through your body is with the use of testing equipments. For example, a body voltage test can show you how much voltage goes through your body as you get closer to an electric field. Other testing meters produce a specific sound for each radio frequency (RF) source, and a reading of the power of that field. With those physical signs, you can now become fully aware of your radiation exposure and to what extent; it is no more invisible. It shows you where it is coming from, from your wiring & appliances and wireless equipment inside the house, or from outside sources, your neighbors’ equipment (Wi-Fi routers, smart meters…), and from the cell phones towers and other distant sources. 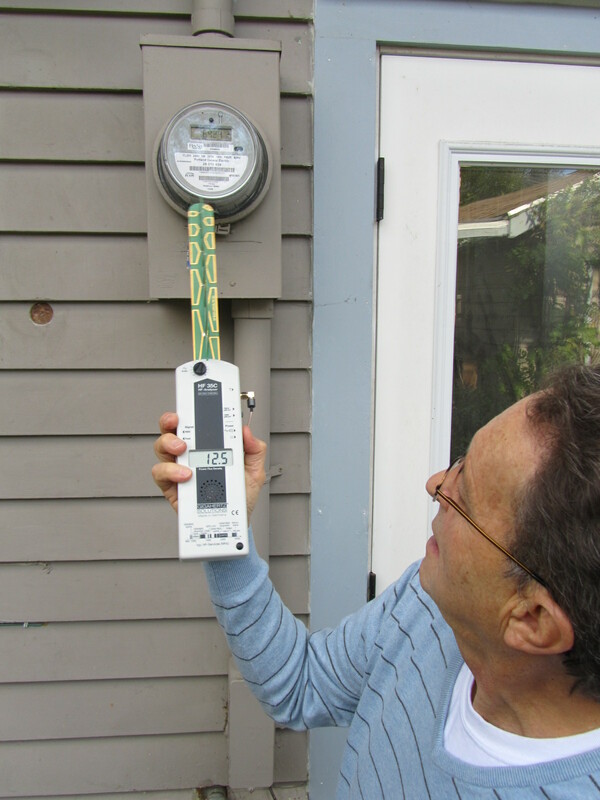 That radiation is going through your walls, windows, roof, floors…and YOU! This EMF invisible INVADER impacts your health and quality of life NOW. EMF radiation testing is usually done by a Building Biologist who is trained to make a complete survey of your home and any space where you spend a lot of time, and to recommend the best cost effective actions to reduce or eliminate your exposure. Fields measured and their intensity , either in document or spreadsheet format. A list of remediation measures and strategies that you can undertake yourself to reduce the fields. A list of remediation products that are available for when you can’t reduce the field with simple measures. A personal follow-up phone consultation to answer all your questions! Rodrigue uses an RF Meter to survey a residential electric service meter. What kinds of fields will be measured? Survey time varies with size of space and what is tested. Pricing starts at $300.Partial surveys possible on a bid basis. Please do not hesitate to request an estimate. Partial trade possible. Commercial surveys done on a bid basis or per an hourly rate of $75 + mileage and traveling time allowance. Gift Certificates available: any amount.